But what happens if you combine the two? Arby's, the fast food restaurant known for its roast beef sandwiches and curly fries, decided to find out. First, Arby's decided it wanted to make a sandwich based on Philadelphia. The Fire-Roasted Philly was born. Arby's describes the sandwich as "Layer Angus steak on a toasted Philly sub roll. Top it with fire-roasted red and yellow peppers, provolone cheese, and roasted garlic aioli." 26 years before the creation of the Fire-Roasted Philly, Jeff Townes, known as DJ Jazzy Jeff, and Will Smith, known as The Fresh Prince, were working up a creation of their own - a TV show theme song. It was to be used for Smith's new comedy 'The Fresh Prince of Bel-Air' in which Jeff would have a guest starring role. Townes produced the beat and Smith penned the lyrics. The entire hip-hop song was completed in less than a half hour. "When making music, some ideas comes in very quickly...most of the good ones happen like that. We've made a lot of records that happened that fast. Music is usually the best when you don't overthink it or try too hard. That's music in its purest, most authentic form," Townes told Action News. Once the song premiered, the beat and the words "In West Philadelphia, born and raised" instantly became a part of pop culture - not just in Philly, but all over the world. And with each year, the song's popularity continues to grow. "It still shocks me that people still love the theme song. I work it into my set every once and a while and its incredible how people respond. As an artist, you can only hope you have something that stands the test of time in your career. We're truly blessed," Townes said. 'The Fresh Prince of Bel-Air' theme has popped up all over the place since the show left the airwaves. In fact, it has been covered by late night hosts and popular musicians of all types including One Direction. But that latest cover is by Ving Rhames - the voice over actor on the Arby's commercials. Just like Will Smith did back in the 90s, Rhames begins with "In West Philadelphia, born and raised" as the Fire-Roasted Philly sandwich is showcased - first up close and then zoomed out to see the entire steak sandwich. Using the classic theme was an idea by ad agency Fallon, Arby's tells Action News. Arby's says the sandwich, which is now a permanent menu addition, may not be a traditional Philadelphia cheesesteak, but they wanted to create a taste of Philly for guests to enjoy across the country. "We've had a Philly-style sandwich on our menu for years, but decided to rework it and elevate it to match the rest of our premium meat sandwich options," Arby's says. The Fire-Roasted Philly now joins Arby's other offerings such as their Italian, Reuben and chicken and steak fajita flatbreads. Nope, it's not followed with the usual, "You're movin' with your auntie and uncle to Bel-Air." 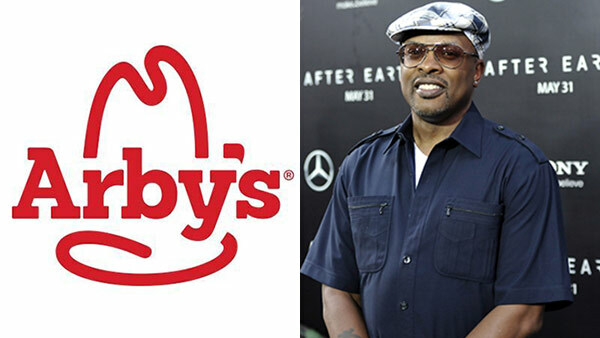 Instead, the rapping stops, and Rhames replaces the lyrics with Arby's tagline - "Arby's. We have the meats." DJ Jazzy Jeff discovered the ad after someone shared it with him on social media. "I think it's very cool for people to like the song enough to want to use it. People have used for it for things in the past," Townes told Action News. That even includes on Jeopardy! where Alex Trebek gave it his best try. Who knows where you'll hear the theme song next? As you wait, you can pull up to an Arby's about 7 or 8 and tell the cabbie, you're ordering a Fire-Roasted Philly.